Even as he has repeated pledges of loyalty to President Donald Trump, longtime political operative Roger Stone would not categorically rule out forging a cooperation agreement with special counsel Robert Mueller, when asked about that possibility during an appearance Sunday on "This Week." "You know, that’s a question I would have to -- I have to determine after my attorneys have some discussion," Stone told ABC News' Chief Anchor George Stephanopoulos on “This Week” Sunday. "If there’s wrongdoing by other people in the campaign that I know about, which I know of none, but if there is I would certainly testify honestly,” Stone said. “I’d also testify honestly about any other matter, including any communications with the president. It’s true that we spoke on the phone, but those communications are political in nature, they’re benign, and there is –- there is certainly no conspiracy with Russia." Stone, 66, President Donald Trump’s longtime friend and a veteran political operative, was arrested in the predawn hours Friday after the special counsel filed a seven-count indictment against him as part of an ongoing probe into Russia interference during the 2016 election. His remarks came in one of a series of interviews he has given ahead of his arraignment in federal court in Washington on Tuesday. In his typically combative and colorful fashion, he has maintained his innocence and vowed to fight the special counsel’s charges in court. Stone told Stephanopoulos that his attorneys "believe that this indictment is thin as piss on a rock." Immediately following the interview, new House Intelligence Committee Chairman Adam Schiff, D-Calif., and then former New Jersey Gov. Chris Christie, an ABC News contributor and Republican who has advised Trump -- each described the charges against Stone as strong and persuasive. Both men are former prosecutors. “I think he’s going to need a much better defense than you just heard,” Schiff told Stephanopoulos. And Christie said, "Well, listen, I think if he decides to go to trial, he’s in very, very grave danger. Everyone is presumed innocent, George, and so is he. But the indictment, I think is a pretty damning indictment." 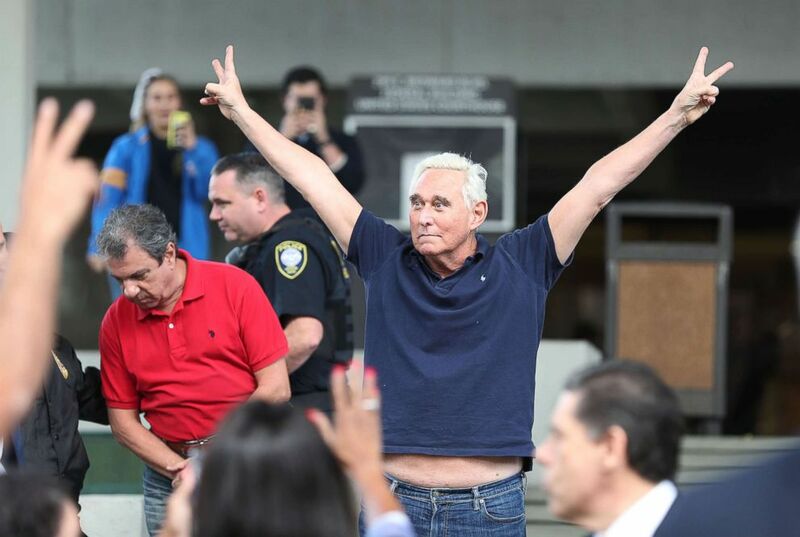 Roger Stone speaks after his appearance at Federal Court in Fort Lauderdale, Fla., Jan. 25, 2019. The special counsel leveled against Stone five counts of lying to Congress, one count of obstruction of an official proceeding, and one count of witness tampering. Within hours of the FBI’s arrest, Stone made an initial court appearance Friday morning, where a federal judge set his bond at $250,000 and limited his travel to Florida, New York, Virginia and Washington, D.C.
Stone, a decades-long friend of Trump's who has taken credit for persuading the president to get into politics, served as an adviser to Trump’s presidential campaign but left amid controversy in 2015. "Have you ever had any conversations with the president during the campaign or since the campaign about Russia or the Mueller investigation?" Stephanopoulos asked. "None whatsoever," he said on "This Week" Sunday. "Categorically. ... Zero. Zero." Stone confirmed his relationship with Trump during the campaign, despite a tweet Saturday from the president seeming to distance himself from Stone. Roger Stone, a former adviser to President Donald Trump, exits the Federal Courthouse on Jan. 25, 2019 in Fort Lauderdale, Fla.
"I never discussed these matters with the president and everything that I did regarding trying to get as much public attention to the WikiLeaks disclosures among voters, among the media is -- is constitutionally protected free speech," he told Stephanopoulos. "That's what I engaged in. It's called politics and they haven’t criminalized it, at least not yet." 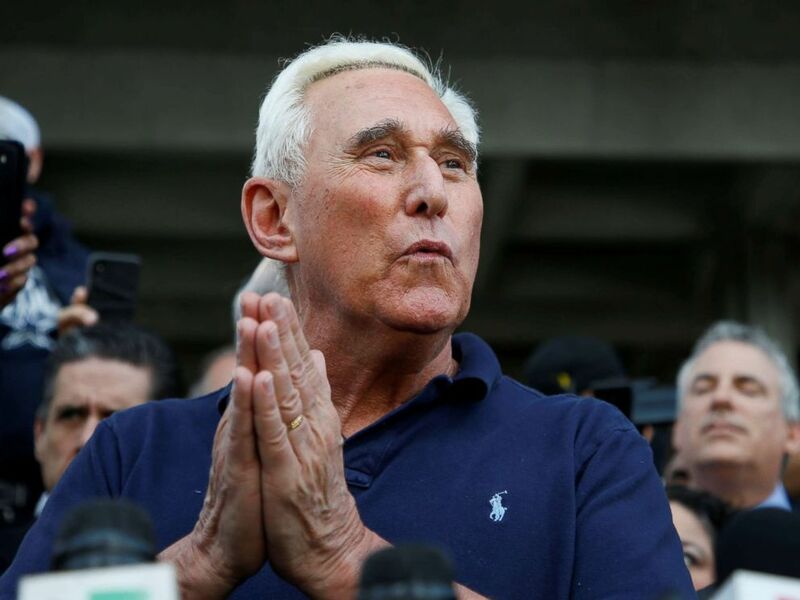 Stone also pledged on Friday to fight the charges and reiterated his support for Trump, a man who he supports politically and says he considers a close friend. More than a dozen witnesses associated with Stone have been contacted by the special counsel's office, many of whom have appeared before the grand jury impaneled by Mueller’s team. The witnesses have told ABC News they were asked about Stone’s dealings during the 2016 election and what, if any, contact he may have had with WikiLeaks publisher Julian Assange through an intermediary. Among them include two who confirm to ABC News that they were specifically referred to in Stone's indictment. Political humorist and radio show host Randy Credico, whom Stone claims to have asked to act as an intermediary for him to contact Assange to confirm that the Wikileaks founder had a cache of information on Clinton during the 2016 campaign, is "Person 2" in the indictment, who Stone exchanged text messages with about Assange and Clinton related leaks, and who Stone was charged with one count of witness tampering with over efforts to tamper with Credico's testimony before the House Intelligence Committee. Jerome Corsi, the former Washington bureau chief of the far right site, Infowars, who is known for his role in pushing political smear campaigns, confirms he is "Person 1" from the indictment, who emailed with Stone about efforts to "get to Assange" and seemed to relay information about material Wikileaks had in the summer of 2016. "I think the way I was treated on Thursday is extraordinary," he said. "I think the American people need to hear about it." A swarm of FBI agents wielding long guns and tactical gear took Stone into custody at his Fort Lauderdale home on Friday and obtained search warrants for his homes in Florida and New York City. He continued to complain about the show of force Sunday. "This was an attempt to poison the jury pool," he said. Those indictments have led to seven guilty pleas and three people sentenced to prison. Four former Trump campaign officials -- including his onetime national security adviser Michael Flynn and campaign chairman Paul Manafort, also a former associate of Stone -- are among those who have pleaded guilty. ABC News’ Lauren King, Lucien Bruggeman and Quinn Scanlan contributed to this report.